I’ll give you “four potatoes” for an intro, then join in and play along with me and the banjo, guitar, mandolin, Mt. 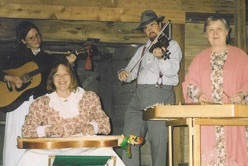 dulcimers and autoharps. We’re ALL there! You can tell we’re all having fun.